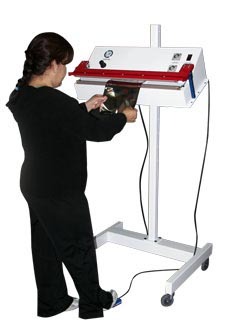 Aline bag sealers are perfect for budget and space conscious bag sealing applications and are ruggedly built to provide years of trouble free service. 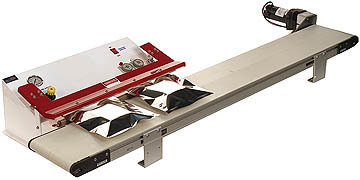 Each pneumatically powered bag sealer unit has sufficient jaw clearance to introduce your package from back to front or side-to-side. Standard controls include a glycerin filled gauge, pressure regulator, separate heat and cool timers and a tap to start foot pedal. This ensures that each bag seal will be airtight and water tight. 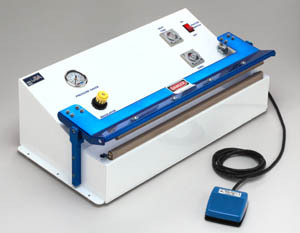 All Aline bag sealers are powder coated and therefore clean room compatible. A bottom flange allows for this bag sealing unit to be mounted horizontally or vertically. Each unit comes complete with a ONE YEAR WARRANTY, detailed operating instructions and a spare parts kit. 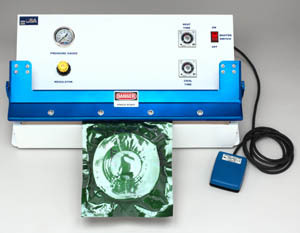 bag sealer - Click here for a larger view! 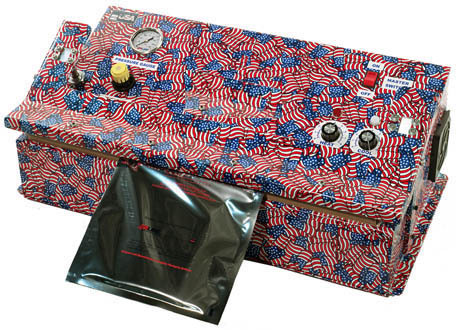 bag sealer with American flag powder coat MP-15. Click here for larger view!